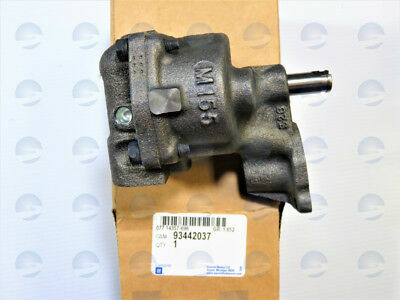 That is a standard volume pump with a 3/4" inlet pictured, and that is what GM used from about 96 on. You're very sure about that? They are both listed as standard pressure but the one that costs $90 more is listed as high volume. That should be quite a scandal. Edit: I just spoke with Jegs and they are very sure that the casting has been milled and bigger gears installed for the 93442037. Last edited by CGT on Mon Oct 01, 2018 12:08 pm, edited 1 time in total. Well, I am thinking that the GM spec for a high volume pump is different from what Melling produces and markets as their own high volume pump, using a different casting. I know with Dodge Neon 2.0 oil pickups, the OEM piece has a cover and the Melling stock replacement doesn't. And it may have been originally, like I mentioned the GM part wasn't always a melling m155 in the box, but it has always been a standard gear height, .750 inlet pump. It currently is identical though...spring and all. https://www.corvetteforum.com/forums/showpost.php?p=1571657196&postcount=1 wrote: I need to buy an oil pump for my LT4. Due to the fact I'll be using the stock oil pan I can't use a high volume pump. The dealer tells me that #1 is the LT4 pump. So which one is the one I can use that will not starve the pan or send too much oil pressure and perhaps break something? Both pumps come with out the oil screen but Melling sells it. https://en.wikipedia.org/wiki/Chevrolet_small-block_engine#LT4 wrote: The LT4 was a special high-performance version of the new-generation LT1. With the addition of a slightly more aggressive camshaft profile, 1.6:1 roller aluminum rocker arms, high-flow intake manifold (painted red) with extra material above the port available to allow port matching to the raised port LT4 cylinder heads, it was rated at 330 horsepower (250 kW) and 340 lb⋅ft (461 N⋅m). It was introduced in the 1996 model year, for the last year of the C4 Corvette, and came standard on all manual transmission (ZF 6-speed equipped) C4 Corvettes. The engine was passed down to special versions of the Camaro and Firebird the next model year. All 135 production engines for the Firehawks and Camaro SS were completely disassembled, balanced, blueprinted and honed with stress plates. One in 5 engines was tested on a Superflow engine dyno and every car was tested on a chassis dyno in addition to performing a short 6-mile (10 km) road test. Is it certain that the images are not the usual generic "representative" ones? Well, that is why I called Jegs. The one in that pic has been in a vise! I suspect that if the 93442037 from GM is measured it will be found to supply a 10% increase in volume. Okay, now people can argue about whether 10% or 25% is better. The gm one in your pic will measure and flow the same as a m155 from melling lol (ITS THE SAME PUMP) . The 10 and 25 percent over pumps are a different series from Melling, they don't look anything like the GM pump. But ok. I currently am holding a 93442037 and a m155a in my hands. Yes, I know that they are for a different series of pumps by the patent application date. The point is that it would be simple for GM to specify an additional 10% in volume WHICH MAY NOT REQUIRE a different casting from Melling at additional cost thereby mollifying GM accountants. If you are holding one, just disassemble it to be sure. Measure the gears. Directly compare them to the standard pump you have. Yes, they are the same...spring, gear height and all. Ive done this several times already in the past. I wouldn't have spoken up about it if I hadn't.